Welcome to the Home of The Heroes! Eldor: Happy Thanksgiving to everyone!!! Fireheart: Guild Meeting moved to 16 Aug! Kai: I will not be around tonight. I'm taking care of a sick Fi. On and off AFKs will not benefit the group. Sorry, see you all next week. Error: The Host for this RSS block is unreachable. Please update this block in the Layout tab of your Site Admin. The first day I took over this guild, I thought of the few of us that were together as just that, a group of friends that would get online from time to time to play some games and have fun, and then just go on and live our lives away from this virtual place. As time went on, I watched everyone grow closer and noticed that we all spent a lot of time together and enjoyed each other's company. In the last year or so, I've seen something I never expected, we all started to really care for each other and treat our fellow guildies like they are as important as ourselves. We have involved our families and friends from our "real" world, and enriched this little community even further. Today, I see our guild as more of a family than simply just a guild. We are all so close-knit and involved in each others' lives that to call us anything less than family doesn't feel right. But that makes our recent losses that much more painful. While we were aware Ceaver's health was declining, I think it's fair to say that none of us were expecting to lose her so suddenly, or so soon. Her presence with us was always one of mischief and playfulness, and the situation with her health gave her a deep appreciation of life that she always tried to impart on all of us. And as if one wasn't hard enough, we now have another painful loss with Drak's passing. Drak has been a member of our family for such a long time, and was always willing to help out and make jokes, and just be a smiling face among friends. Our family is forever changed for the better for having had the privilege of these two wonderful people among us. I do not believe any of us can ever truly be ready to lose the people we love, and I don't think any of us were expecting things to happen as they have. But while I know we are all hurting, I hope we are all able to carry on their lights in our hearts and lean on each other for comfort. Please give your love and support to Kane and Loeci, and to each other during these hard times, and keep the memory of our friends alive in the heart of our guild. July 12, 2017 @ 8:00 PM Eastern! The official thread is HERE, so be sure to check it out! That's right, Heroes! Our Imp guild now has a flagship! You know what that means, right? Now that we have a new ship, it needs a name... something that strikes fear into the heart of our enemies! Or maybe instead something that gets some lulz from other players? The choice is yours! Here on this post, everyone may list their suggestions! Ultimately, us officers will pick out our favorites and make the final selection. For reference, our Republic Flagship is currently named "The Party Bomber". Whether we make the Imperial Flagship a sister ship, or something completely different, it is an important thing to note. Parties are serious business in this guild, after all. I'll be on often Thursday and Friday, primarily decorating, so whether you stop by to visit now or later, be sure to see what our ship looks like this weekend! It's sure to be a fun time! So this past Sunday, Jan 15th, was the 4th birthday of the guild since I took over. I want to start by saying a big Happy Birthday to the Heroes! I never thought we would survive this far, but I am happy to see us surpass my expectations. I thank you all for sticking with us, and I hope that we have another great year gaming together. The last year has been a tough one for the guild. 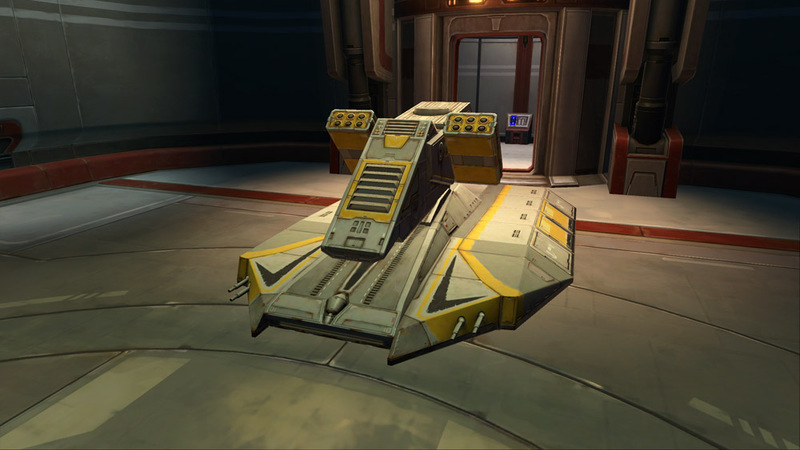 Personal issues and overall unhappiness for SWTOR has driven a lot of people away, but we still have a good small core of people interested in playing the game. I have started talking to everyone about that, and I am committed to making that time as enjoyable as possible for everyone. I still have a great love for Star Wars, and this game in general, and I don't want to walk away from it. As a guild, we have also branched out into other games, and found other mutual interests, and that has also been good for the overall longevity of our family. We have also moved to Discord from Skype and Ventrilo, so if you haven't jumped over, be sure to find us, the info is either in game, or message me and I will give the info to you. I, personally, have come to enjoy our time together as a guild, no matter what we play, and hope to continue that in the future. This was meant to be a very quick post, so in conclusion, Happy Birthday to the guild and our family, and I hope to talk to you all soon. The Heroes are moving to Discord! The Heroes of the Republic will be making some technology changes! As most of you are aware, we use Skype and Vent heavily for communicating both in and out of game. However, after some investigation and testing, we have discovered a similar program that is less resource intensive than Skype, much more user friendly than Vent, and serves the purpose of both! We will officially be phasing out both Vent and Skype in favor of Discord! Check HERE for info and help with the new program! Please feel free to let us know if you have any questions, comments, or concerns! First and foremost, let me officially state what a great honor it has been to be the newest guild officer. I appreciate the trust put in me, and hope to work towards keeping the guild a friendly and enjoyable place to be. With that being said, I have some important announcements to make on behalf of the other officers. As of today, and for an indeterminate amount of time, our guild leader and good friend Eldor will be away due to a family emergency. He has full intentions of returning and continuing to care for the guild, but in the meantime he must understandably step away. Feel free to send him kind words. In addition, our other leaders, officers Fi and Kai will be away for a lengthy amount of time as well. In light of these absences, I will be handling official guild matters for the time being. If you wish to reach me, you may do so via this site, or our guild's official Skype chat. (You can message me here for an invite to the chat.) I would prefer private matters be discussed on the site, but if requested I can share my Skype information as well. My availability will be often, but infrequent, due to my job's irregular schedule. But I am almost always present Monday and Friday nights, and most weekday afternoons. Message me any time! With those announcements made, it's time we discuss the game itself. Many members are participating in the Dark vs. Light event, and therefore have many new characters and classic content they wish to work through. Whether it be leveling, flashpoints, pvp, world bosses, or operations... It's a prime opportunity for us to group together and accomplish achievements as a guild! I encourage active discussions to arrange teams to complete our goals. To that end, Zayse is setting up a Heroics Group here. It's a good way to level quickly and earn lots of credits! Concerning the Mondaylorian Group, with three members away, there will be a postponement in advancing through HM ops. That being said, I propose making the night dedicated to tackling HM flashpoints. (This can be debated among group members, as it's merely a suggestion.) This night will still give the group's core members' priority, but others are more than welcome to sign up, sub in, and assist, or even just hang out! Thursday night's Mr. Group is still running operations, supported by Zayse. Wednesdays and Fridays are open for tackling conquest missions, or whatever those present decide. They can also be a good time to enjoy the game with the guild. Saturdays are still Imperial-faction focused. If anyone is interested in arranging something on one of these nights, or at a different time, feel free to ask! That's all the news I have for today. If you have any questions concerning anything in this news post, please comment below or message me. I'll do my best to answer them. Hope everyone is having a good summer! I look forward to seeing you all in game. May the Force be with you! Monday's Progression group has a Tank opening! If you'd like to have a tryout, post HERE! Anyone feel like making more money? Zayse is organizing a casual/low-commitment Heroics group! Level 65 End Game Gear Guide! As always, feel free to contact your officers or Eldor for anything you need to talk about! We hope to see you in-game soon, and may the Force be with (or serve) you! Hello from the Dark Side, and NEW OFFICER HAS APPEARED! As of the most recent guild meeting, we officially have a weekly Imperial Operations Night every Saturday at 9:00 pm Eastern! This op night will be just like our Friday night op; it will be laid back with no set group or requirements, just fun! So please be sure to go HERE to sign up for our first one! We hope to see you guys around soon <3 Til then, may the force be with you!